Kids got an invite for the birthday party from a friend, and their happiness knew no bound. From that very moment, they started planning for the party. What to wear? which bag to take for carrying return gifts? When to go? omg.. the list is never ending. Actually, this is the scene at my house after getting an invite to the birthday party. This birthday party was at Catapult trampoline park and we all were super excited to visit the wonderful place. The name itself was enough to raise curiosity about the place. As a child, I never jumped on the trampoline at least and I don’t remember seeing the one. Kids nowadays are really lucky as they have many such places specially designed for them. 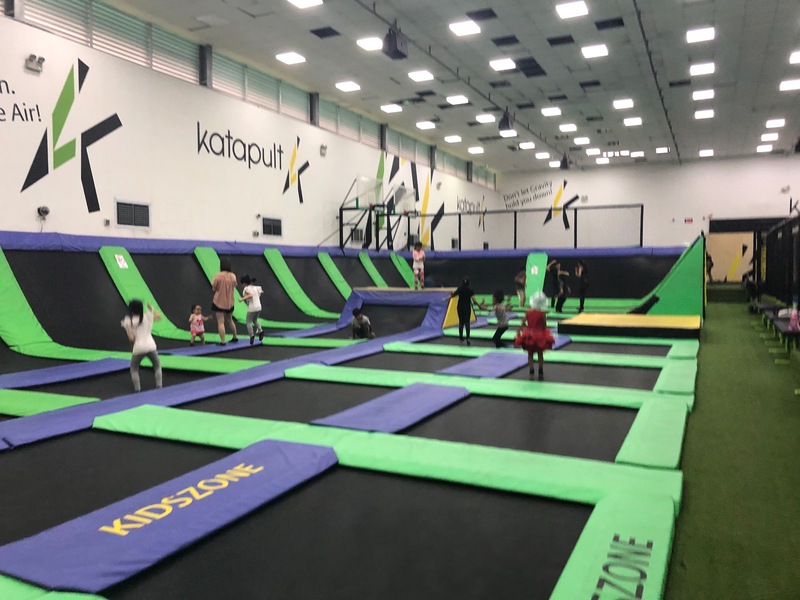 Katapult is located at the ORTO park near Khatib MRT station in Yishun, Singapore. The complete place is interesting and has various restaurants and eateries located in surrounding of the lake. We reached the place on time and registered kids at the entrance of the park. It’s a huge building and has a spacious interior as well. It’s a paid indoor playground and has a party halls for celebrations and parties.The band and the socks were provided by the staff before entering the playground. I was looking for the place to seat and monitor kids and surprised to see the huge deck with seating arrangements. Before I could meet the hosts of a party Kids jumped on the trampolines. (It’s expected:-))There are a variety of trampolines in the park and all kids were busy in exploring. We were worried about the younger kids and wanted to enter the park. But staff in the park told us that they will take care of the kids. There are dedicated marshals in the park and they take proper care of kids. For every group, they have one or two marshals. So now mommies could really seat and relax,( though sometimes we just peeped from the top). It was 2 hours party and kids utilized each and every minute of the time. They didn’t even turned up for the short break. Forget about eating, they didn’t want to cut the cake. The huge playground has an amazing set up to entertain the kids. We joined our jumping league for a few minutes. Actually, we wanted to click the photo with a birthday boy and couldn’t control to try the trampolines. 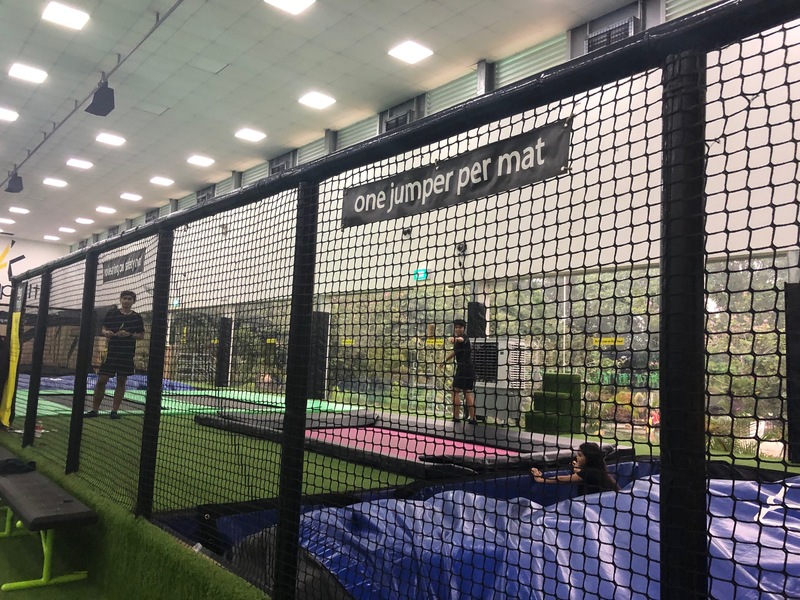 After trying the jumps, we realized how much fun one can have on the trampoline.The short span of jumping was convincing enough to have another birthday party in trampoline park. One thing all of us noticed about Katapult is, The staff is very friendly and they helped us throughout the party. Kids had their feast after cake cutting ceremony and another round to the playground. None was ready to leave the playground and go back home. I promised kids for another visit to Katapult and then only we left the place. I must admit the indoor playground is a must visit for kids and adults too.